Nathaniel Woodhull Elementary School’s two St. Baldrick’s Day events have raised more than $5,600 combined thus far. Nathaniel Woodhull Elementary School recently came together to support the fight against childhood cancer by hosting their second St. Baldrick’s Foundation fundraiser, a fun event to shave heads and raise money to support research and help find cures for childhood cancers. This event, like the event two years ago, was spearheaded by fifth-grade teacher Jonathan Germer, and held to celebrate fifth-grade student Frankie Mattera, who was diagnosed with cancer approximately five years ago and is currently in remission. Frankie agreed to have his head shaved again along with Mr. Germer and school psychologist Bob DeSantis, teachers Christopher Miranda, Chris Mocera and Michael Murphy, custodian Mike Schiavone, Brian Caffrey (husband of teacher Elizabeth Caffrey) and SCPD 7th Precinct Officer Chris Sanchez. Thanks to the generous support of the Nathaniel Woodhull family and William Floyd school community, this year’s effort has so far raised more than $1,600. The fundraising page will remain open. The event held two years ago raised more than $4,000 for the St. Baldrick’s Foundation. 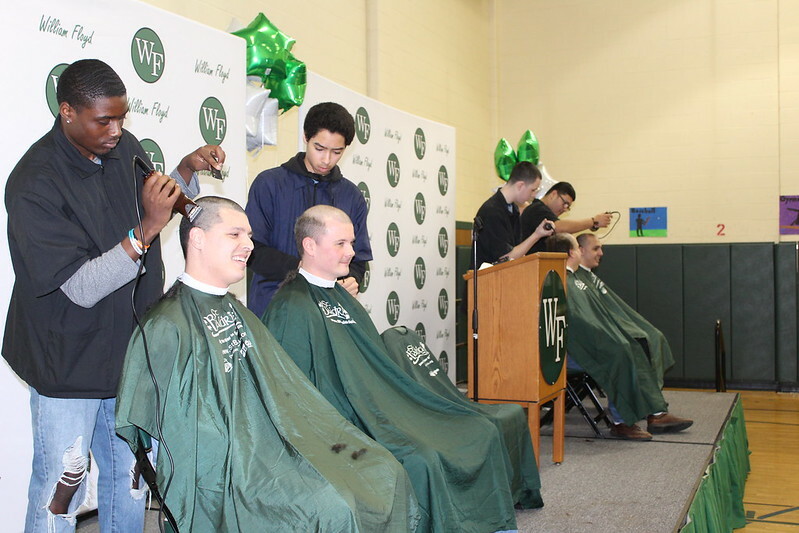 Special thanks to Anthony Montanez and William Floyd High School Barbering Academy students Jy’air Bailey, Josh Herrera, Tavian McCarron and Brandan Reising, who had the honor of shaving the heads of the nine volunteers. Brandan Reising also had the opportunity to shave his former elementary school teacher, Mr. Murphy. The event also garnered media coverage: you can view the PIX11 News report here, along with the Greater Moriches story here. Please enjoy additional photos in the album below!